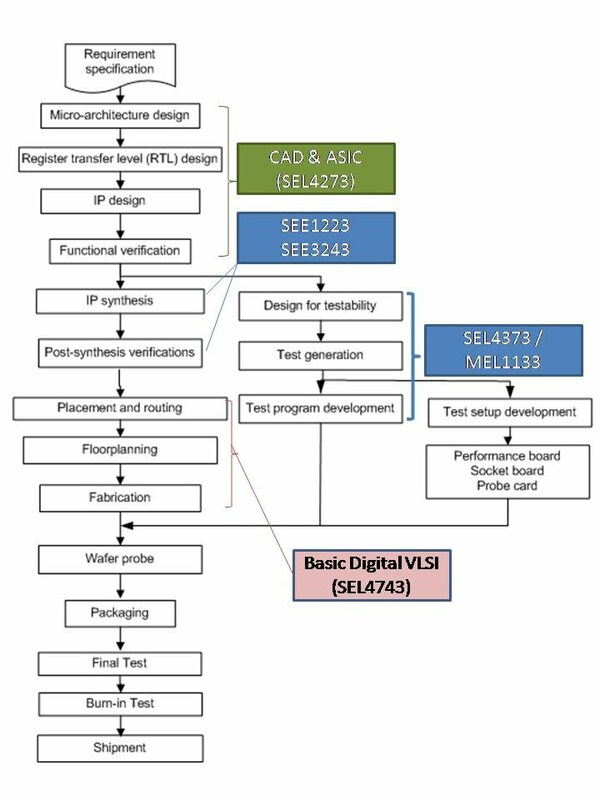 This page shows the courses I have been teaching since year 2003 and how they are related to the industrial VLSI realization flow. By making use of electrical characteristics of individual electric and electronic elements, several kinds of circuits which realize particular functions will be treated. The devices treated are mainly linear passive devices such as resistors, capacitors, inductors, and nonlinear elements like rectifying diodes. Topics include Ohm's Law, AC and DC, phase and phasor, series and parallel resonance, as well as impedance. This course introduces the fundamental of digital electronics. The student is first taught about the number system and logic gates before they are exposed to both combinational logic network and combinational MSI logic. In subsequence of this, the fundamental of sequential logic, flip-flop, counter and shift register will be taught. This course is a basic digital design course which emphasizes on techniques to design combinational circuit using basic gates and MSI. It also focus on basic sequential elements such as flip-flops and latches. This course is a continuation from basic digital electronic course. It emphasizes on techniques to design, analyze, plan, and implement complex digital systems using programmable logic, with specific focus on programmable logic devices. In order to facilitate learning process, a computer-aided design (CAD) software is used throughout the course. Some practical or almost actual environment problems and solutions are provided. This course introduces students to the techniques of testing a circuit and designing a testable circuit. This course covers issues on test – from various angles – circuit as well as system levels. It also touches some non technical issues such as economic point of view and challenges. Several test techniques as well as design for test methods will be covered in class. Students are expected to do lots of reading and the course work will emphasis more on assignments and presentations.